Google announced their new app called "Google Wave" yesterday with the idea that it's what email and text messaging would be like if they were built today. 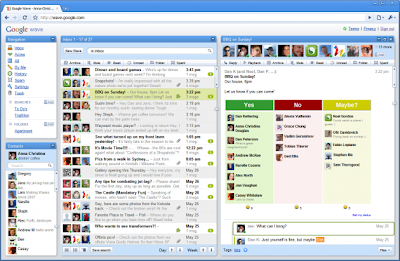 Google Wave actually is a new form of communication that marries live email and media with texting. As a result, you can instantly communicate with as many people as you want at the same time in real time. This is perfect for the Music 3.0 artist since the basic premise behind M30 is that for the first time an artist can interact, market and sell directly to his audience. The more the artist interacts, the more the fan base craves it. With Google Wave, interacting with your "tribe" (as Seth Godin call it) can be easier and more efficient than ever. Efficiency is the one thing that an artist, company or individual really needs, since keeping up with the various social networks can take an enormous amount of time. Most artists have a problem keeping up with a blog, website, MySpace, Facebook and Twitter, but there are over 40 domestic social networks with more than a million subscribers each and another 40 world-wide. Add to that various news sites (over 300), video distribution sites (over 100), hub sites, forums and groups, and associated blogs and you have more than a full time job. Even a web-sophisticated artist burns out when presented with so many options. Google Wave won't solve this problem, of course, but it might become an alternative way to stay in touch with the fan base. It's too early to tell, since it was only just announced, but it looks pretty cool and worth checking out. You can read more at Techcrunch and Lifehacker. A graphic of Google Wave appears below. A report to be published in the International Journal of Internet Marketing and Advertising says that longer, higher quality free music samples engage more listeners. It seems that the normal 30 seconds of most samples just don't do the job. The problem is that 30 seconds usually doesn't hit enough of the hooks of the song (or maybe none at all) that a listener might really love. A longer sample is more likely to hit the part of the song that you want to hear over and over and therefore, buy the song. Yanbin Tu in the Department of Marketing at Robert Morris University and Min Lu in the Department of Finance and Economics, have studied digital music samples and their survey suggests that for music samples, the most effective sample is high quality and is a longer rather than a shorter sample. "Digital music samples with a higher quality and longer segments were found to increase the sampler's music evaluation and make the evaluation process more useful," the researchers say. Higher music evaluation then led to fewer consumers taking the music sample as a substitute for the original music. The lesson for the industry is that the current practice of offering only short, low quality samples is not ideal. The basic idea behind giving someone a sample of anything, be it a snack food or razor blades, is to provide the best experience possible to turn that person into a customer. It just goes against logic and common sense to even think about providing something of a lessor quality and expecting a sale as a result. But this is the music industry, an industry that frequently defies common sense. It's wishful thinking to hope that this report will have any impact on business as usual. But artists can take these findings to heart and provide prospective customers with the best experience possible - as in give the whole song away for free. Surprisingly enough, the more you give away, the more you end up selling - a basic premise of Music 3.0. Yesterday Paul McCartney and Ringo Starr introduced the new Beatles: Rock Band game at the E3 gaming conference in Los Angeles. While I've been hard on Rock Band and it's players in past posts, I must admit that this looks pretty cool. Plus, there's empirical evidence everywhere that the Rock Band and Guitar Hero games have actually driven kids to learn to play instruments, which is a good thing culturally and musically. Enjoy this sample of the game (the graphics are great!). Concert promoter Live Nation is instituting No Service Charge Wednesdays beginning on June 3rd. They will eliminate the hated service charges on more than 5 million lawn seats at various amphitheater shows across the country. Live Nation is not a company that normally does these things out of the kindness of their corporate heart, so it's fair to say that the downturn in concert attendance (see my post of May 12th) has something to do with this promotion. The promotion can be a smoke-screen however, since it's already been indicated to industry analysts that they'll make up for the shortfall by raising concession prices. The good thing for concert goers is that you don't have to buy a beer at the event the way you are forced to normally pay their exorbitant extra fees. With service charges, you don't go if you don't pay. With concessions, you just stay hungry or thirsty until later. When asked the exact reason why the company was dropping their fees, a spokesman said, "Our June 3rd No Fee Wednesdays promotion is the biggest national promotion in the history of the company, so we think this is a great start. We encourage fans to take advantage of the huge savings that day. If they do, it will send a strong message to the music industry about how strongly consumers feel about ticket fees." The last line is particularly interesting since they are the only area of the music industry that imposes extra service charges and fees. Does that mean that they got the message? This is a good start that doesn't go far enough. It's only for one day a week, it's only for the cheap seats, and it still doesn't address ticket prices that have gotten out of hand. The best thing that could happen is for concert goers to ignore this promotion and drive concert attendance down during the lucrative summer months. Check back in August to see how we're doing. 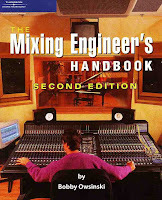 Since I'm the author of a best selling mixing book (The Mixing Engineer's Handbook), I'm frequently asked to review mixes. And while many are remarkable and are a display of great talent, there does exist a category of mixes that, for want of a better term, you could call "amateur." An amateur mix usually means that you've not spent enough time listening and learning, but when you can't determine why a mix sounds great, the next best thing is to determine when you have something that's, shall we say, less than great. So here are the 7 characteristics of an amateur mix. Does your mix have any of these characteristics ? 1) No Contrast - The same musical textures are used throughout the entire song. This is generally an arrangement issue, which the mixer can affect somewhat since mixing is so much more than balancing. It's influencing the arrangement by what you mute, emphasize or lower in the mix. 2) A Frequent Lack Of A Focal Point - There are holes between lyrics where nothing is brought forward in the mix to hold the listener’s attention. Granted, this is an arrangement issue too, but it's your job as a mixer to find some point of interest and emphasize it. 3) Mixes That Are Noisy – Clicks, hums, extraneous noises, count-offs, and sometimes lip-smacks and breaths are all things that the listener finds distracting. It may be a pain to eliminate these distractions but you've got to do it to take the mix to where it has to be. 4) Mixes That Lack Clarity And Punch – Instruments aren’t distinct, and low-end frequencies are either too weak or too big. This is really the number one indication of an amateur mix, especially in the low end. It's either way too heavy or way too light. The way around this is to listen to other records that you think sound great and try to emulate the sound. Sure it takes time, but it will get you in the ballpark. 5) Mixes That Sound Distant And Are Devoid Of Any Feeling Of Intimacy - The mix sounds distant because too much reverb or overuse of other effects. This is another common trait since a newbie mixer thinks the plug-in effects are so cool (because they are!) that they want to use them all on everything all the way through the song. You'd be surprised just how many effects are used in a great mix sometimes, but the results are so subtle that you can't really tell unless you had the original non-effected sound to compare with. In an amateur mix, you hear them all screaming at you all the time. If you can make it sound great without effects first, you'll automatically moderate their use. 6) Inconsistent Levels – Instrument levels that vary from balanced to too soft or too loud or lyrics that can’t be distinguished. Once again, a newbie mixer usually sets the faders and forgets them, but mixing is just as dynamic as the music. Every note of every solo and every word of the vocal must be heard. Even with automation as sophisticated as it is these days, it still takes some time and a critical ear to be sure that everything is heard. 7) Dull And Uninteresting Sounds — Generic, dated or frequently-heard sounds are used. There’s a difference between using something because it’s hip and new and using it because everyone else is using it. The latest example is the Auto-tune keying trick initially used by Cher, then copied by the Backstreet Boys and most recently Kanye West and others. They've already used it, so give it a rest. It doesn't mean you're cool if you use it, just a copycat. The same with generic synth patches from a Roland Motif (this problem goes all the way back to the 80's with the electric piano sound of the DX-7). We've heard them all. Time for something new. Most great artists strive for something that no one has ever heard before. Although some artists and mixers get lucky by flying through a mix, making and mixing records usually takes a lot of time and attention. We'd all like it to go faster, but there are some things that you just can't let get by. Eliminate the 7 characteristics of an amateur mix and you'll be surprised just how good your song can sound.